The Socialist Party (PS) majority amended the Albanian criminal procedure code prohibiting extraditions only recently. Alleged drug lord Klement Balili will not be extradited to Greece, despite an international arrest warrant by the Greek police, as Exit.al has already explained. Following is an explanation of how the PS parliamentary majority was able to change the related articles of the law. The amendment above was approved in parliament by the socialist majority in power in May, 2018. The opposition contested the amendments proposed and later approved by the socialist majority in May, 2018, stirring a fierce public debate as they came to be seen as pushed forward by former Minister of Interior Fatmir Xhafaj in order to avoid the extradition of his brother who was convicted in Italy. Yet, the amendments were supported by the former EU ambassador Romana Vlahudin, who declared that the amendment of article 491 of the Criminal Procedure Code (KPK) is in compliance to European standards. Exit.al wrote about the misleading statements of Xhafaj and Vlahudin here. Many have benefitted and are set to benefit from the amended law. Edmond Bego had been sentenced by the Turin Appeals Court, Italy, to 21 years in prison, as head of an international drug trafficking organization. The Supreme Court of Cassation reduced his sentence to 11 years in prison, following an amnesty and the summary judgment. Bego was arrested in Tirana in 2009 on behalf of the Italian government. In September 2010, the Criminal College of the High Court made up of Chairman Gazi Dizadari, as well as Fatos Lulo, Besnik Imeraj, Andi Çeliku e Majlinda Andrea decided to reduce the Italian court sentence to 4 years and 4 months. Bego stayed only one year in prison. The Kruja Court released him on parole for good conduct. The Bajri Criminal Group, notorious for its activity in drug trafficking, extortion, human trafficking and prostitution, also exploited the amended law. Safet Bajri was sentenced to 22 years in prison by a Belgian court for human trafficking and prostitution. He has been sentenced twice, first in 2015 to 9 years in prison, then again in 2017 to 13 years in prison. In total he must suffer 22 year in prison. According to the police, Bajri was the man who controlled a main prostitution ring in Brussels. Safet Bajri is one of the main leaders of the Bajri criminal organization, which also includes Enver Bajri, Ilir Bajri (Rustemi), and Behar (Brajgovic) Bajri, all of them brothers or first cousins, with criminal activities in Belgium, the Netherlands, and Albania. Behar Bajri and Ilir Rustemi had been arrested previously by the Albanian police, in 2016, following an armed assassination attempt against Donald Shtjefni, a rival gang member, in Shkodra. However, they were released under still unknown circumstances. Safet Bajri was arrested in Tirana on September 22. He cannot be extradited because there is not extradition agreement between Albania and Belgium. It remains unclear how he will carry out he sentence in Albania. Klement Balili was accused by the Greek prosecution on charges of international drug trafficking and participation in a criminal organization. In 2016, the Greek authorities issued an international arrest warrant for Klement Balili and specifically demanded the Albanian police to arrest him. At that time Balili was Director of Roads Transport Authority in Saranda. Following his arrest, Balili cannot be extradited to Greece because art.419/f of the law prohibits extraditions if there is not bilateral agreement. He will be tried by the Serious Crimes Court in Albania. Mark Frroku had been sentenced to 10 years in prison by the Serious Crimes Court of Nivelles, Belgium for the murder of Aleksandër Kurti in 1999, following a clash between prostitution gangs. The request for his extradition was kept hidden for a long time in the Albanian Interpol office. Mark Frroku was arrested in Tirana after the scandal broke. In 2017, the Court of Serious Crimes ruled him innocent for the murder of the Albanian citizen in Belgium, for lack of sufficient evidence, even though the General Prosecution requested a 25-year prison sentence. 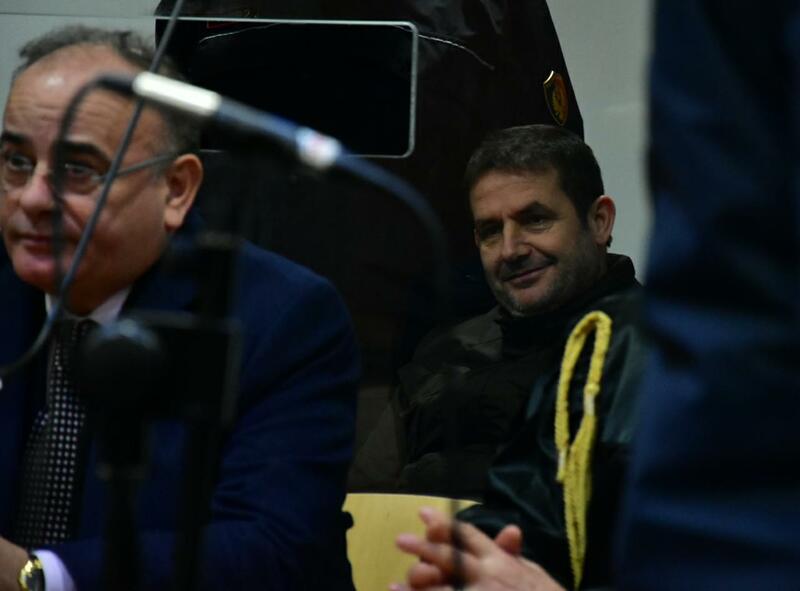 Mark Frroku was convicted in April 2017 by the First Instance Court of Tirana to 7 years and 6 months in prison for “concealing his wealth”, ”money laundering,” and “unlawful construction.” Three years later the Court of Fier released him on parole for good conduct. Arben Frroku was issued an arrest warrant for the murder of police commissioner Dritan Lamaj in February, 2013. The First Instance Court found him not guilty for lack of evidence. Presented with the same evidence, the Appeals Court sentenced him to life in prison. Following the confirmation of the sentence by the High Court, Frroku presented a case of constitutional rights violation, which the Constitutional Court dismissed. Agron Xhafaj was sentenced in 2002 to 7 years and 2 months in jail for drug trafficking and participation in a criminal organization. The sentence was upheld by both the Lecce Appeals Court, and Italy’s Supreme Court. He was convicted without being present in court but represented by a pricey lawyer, Giuseppe Bonsegna. The recent amendments to the law, made while his brother Fatmir Xhafaj was the Chairman of the Parliamentary Commission of Law, should not have allowed for Agron Xhafaj’ extradition to Italy. However, in order to save his minister brother’s face following the scandal when in a video-recording emerged, alleging that Agron Xhafaj still dealt in drug trafficking, he handed himself in to prosecution and was extradited to Italy.